No, it is not the Cutty Sark that has been on the move. Those interested in the old clipper trade think immediately of the slim, record-breaking vessel, its yards creaking and the sheets straining as the billowing sails propel it on, on and on, slicing its way through mountainous seas first to China for the tea trade and then in later years to Australia to take on the huge bales of wool being exported to Britain. The Cutty Sark was launched on the River Clyde, in Scotland, in 1869 and is often spoken of as the oldest surviving ship of its kind. The above copy of a lithograph by Thomas Dutton of the City of Adelaide was made by Cruickshanks. Last edited by wherrygirl; February 28th, 2014, 11:52. The clipper was designed primarily as a passenger ship although she carried trade goods as well, and made her maiden voyage on 6 August, 1864. 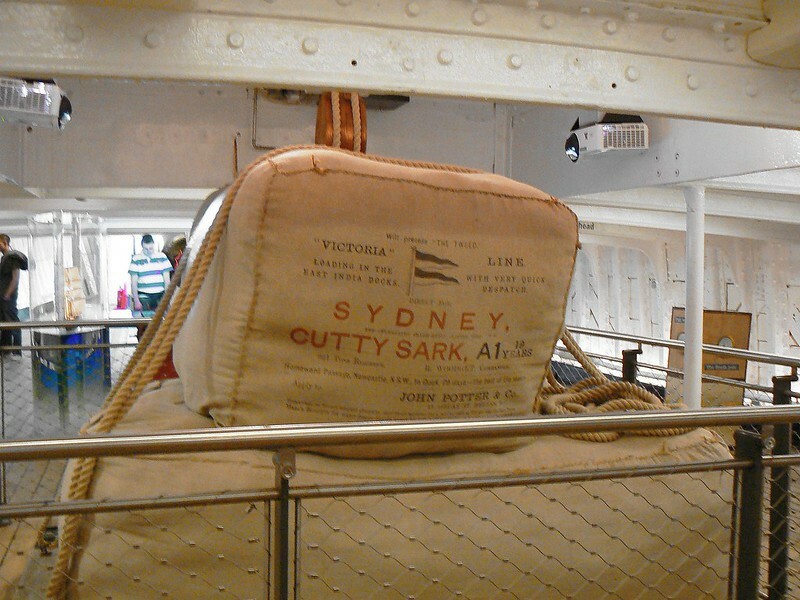 She and the Cutty Sark were amongst the first composite-built ships in the world, and the construction of wood on an iron frame can be seen in this photo I took on the latter ship at Greenwich, where she is on display and where John, his wife and I visited her during their brief stay in London in 2013. 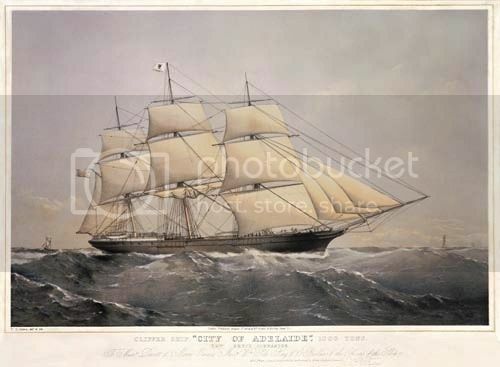 The first trips of the City of Adelaide were between Great Britain and South Australia, carrying passengers and general cargo. But later she led a very varied life, in 1887 being re-rigged as a barque, then used as an isolation hospital, in the 1920s taken over by the Royal Navy Volunteer Reserve, renamed HMS Carrick and used as a training ship. She was eventually sold to a Trust in 1990, but after sinking at her moorings a year later the clipper was refloated and moved to a private slipway at Irvine by the Scottish Maritime Museum, where it was hoped to restore her. However, as so often happens, funds ran out and work was halted. Years went by and in 1999 the owners of the slipway, where she stood slowly rotting, had her removed. Finally, in 2010, when it seemed that this venerable old clipper had no future except the breakers yard or, more likely, the indignity of being demolished on the spot, a group of Australians formed a company to try and have her brought over to South Australia, where she would be restored and cared for in her name city. Plans were made and the Government made a one-off grant towards getting the clipper fit to make the journey. Last edited by wherrygirl; March 8th, 2014, 18:50. Rentokil had the job of cleaning every last inch of the hulk to the satisfaction of Australian governmental experts, who flew over to inspect the work and ensure that the Aussie quarantine rules would be satisfied. 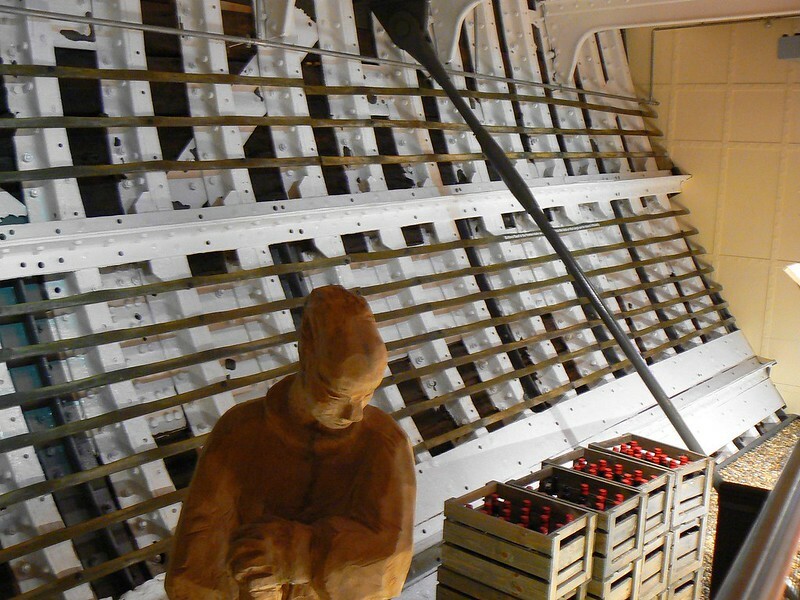 A substantial cradle was made to fit the vessels underside, using laser survey data which reproduced the exact shape to the millimetre and so gave strong support to the ancient timbers, and scaffolding was erected inside the hull to give extra support while it was being moved. 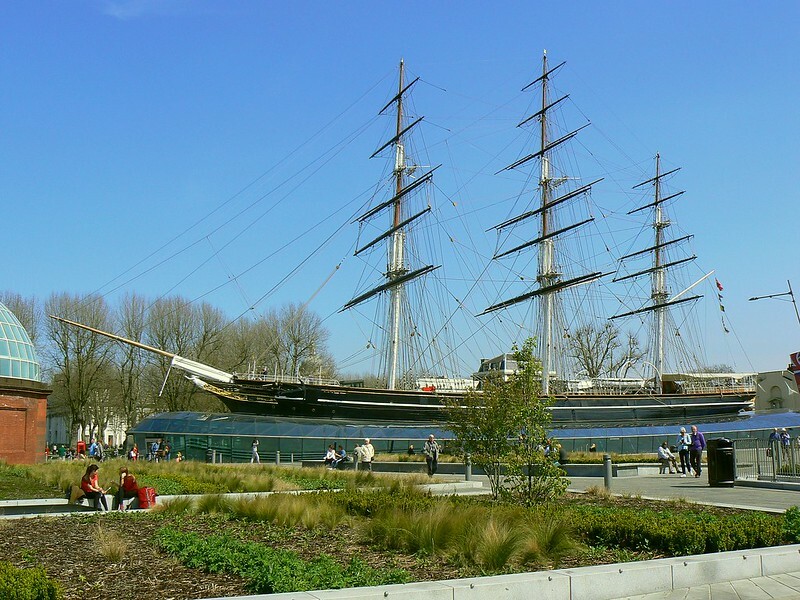 Then she was towed from Scotland down to London, where she was moored alongside her sister ship, the Cutty Sark, for a few days. 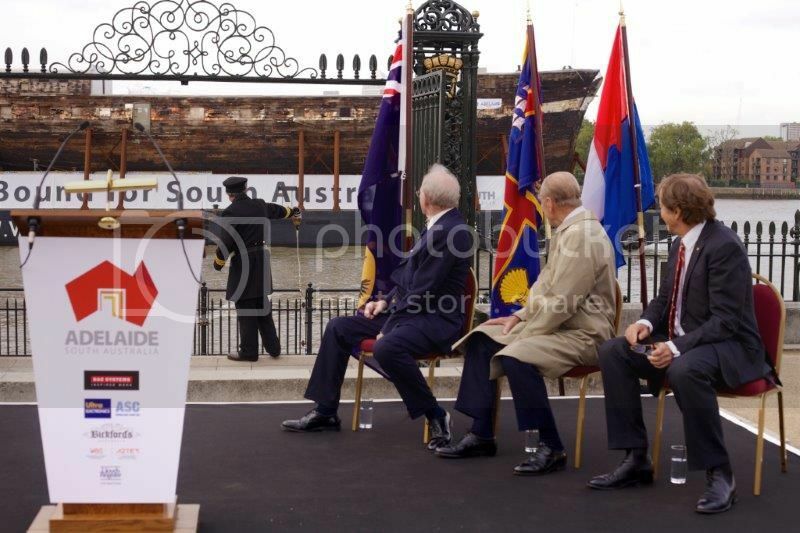 There, at a renaming ceremony, she was given back her original name by the Duke of Edinburgh who had taken a great interest in the whole project from the start. This Flickr site gives superb views of the preparatory work up in Scotland and the farewells as she left on her journey down south to London for the final renaming ceremony by the Duke of Edinburgh. That URL will hopefully take you to the first main photograph of a whole series. For those not familiar with Flickr if you look just below the picture to the right you will see the thumbnails and clicking will enable you to enlarge and browse them. This member is an enthusiast for vehicles other than ancient ships so you will find a few strays mixed in! But click on. Last edited by wherrygirl; March 8th, 2014, 23:45. Good grief but that is a huge amount of work. At present I have not time to read the links (you know,my English.....) but I'll do that when I come back from Dubaî,next week. Thank you, Mark and Yves. Yes, it was a tremendous task to undertake and so many people were involved in Scotland, England and the Netherlands as well as Australia. I have been thoroughly hooked by the clipper's progress over the past month or so and I think that Thijs was very interested, too - even the silent one in Singapore may have been mildly interested in this unusual task for a HLC. 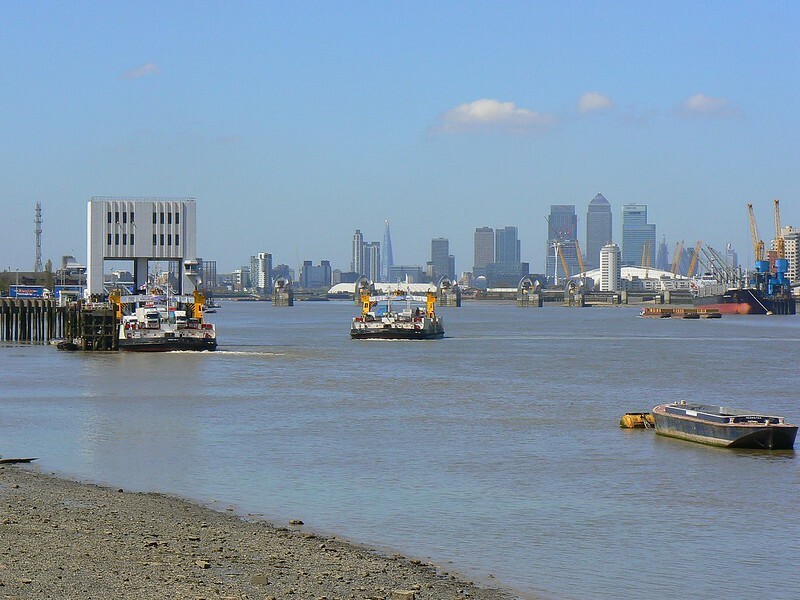 So, at 13.30 on 20 October 2013, the next stage began as the little convoy moved off down the Thames. They were heading for a Dutch port where the hulk would be fumigated, shrink-wrapped and loaded on to a HLC for her journey to the other side of the world. Fumigated? You may well ask! But Australia is fanatical about objects made from animal or vegetable material entering the country. Quite rightly so, the flora and fauna to be found in that great country are often the only specimens of their type in the world and contamination is an ever-present danger. So after years of neglect the hulk had to be fumigated in the second stage of thoroughly cleansing it of the insects and vegetable growths which had made it their home, penetrating deep inside the timber. But I learned about this astounding journey too late to make arrangements to stay in London. Next morning I was worried, what was happening? The map had the Dutch Pioneer anchored at Sheerness at the mouth of the Thames, but the Itineries page said it should have left there the previous evening. The track showed a wide sweep with the tug having emerged from the Thames estuary and then almost doubling back on itself to turn for Sheerness, but that could have been because of shoals or mudbanks at the mouth of the Thames, its a tricky area for shipping. I hoped nothing was wrong. Then a few hours later I had lost her completely - no longer showing at Sheerness but nowhere to be seen across the Channel or North Sea, either. Then, the following morning, (22 October) there she was, having just arrived at Zeebrugge in Belgium ready to move on to Rotterdam for the work to be done to prepare her for the long, last journey. 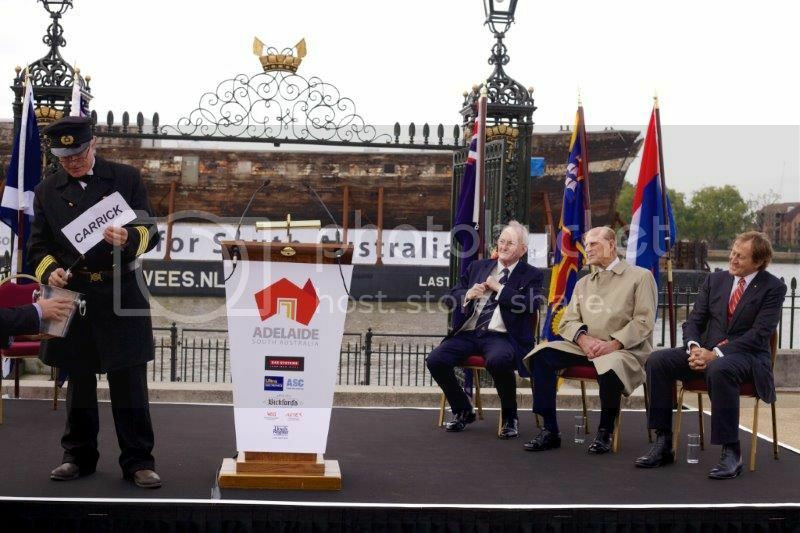 The Australian Broadcasting Co. confirmed that the vessel would be in the Netherlands for a month while being prepared and, sure enough, on 22 Nov., the news was that she was to be loaded that day on to the German heavy lift carrier MV Palanpur at Heysehaven, Rotterdam. It gave the Palanpurs itinerary as via Norfolk, Virginia, USA, on to Cape Town, then Port Hedland in Western Australia, and finally on to Adelaide. I searched all of Rotterdam and eventually, after wandering in and out of the docks, found the carrier. The Palanpur was at Schiedam just east of the Benelux tunnel. I did wonder if Thijs, who was very interested in what was happening, might be able to take any photos in Rotterdam if his work took him there, but that was not possible. 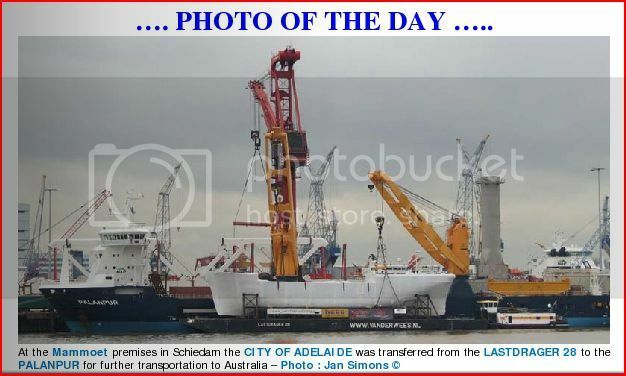 However, Ombugge had given me the link to maasmondmaritime.com where I found this photo of the City of Adelaide at Schiedam, loaded on to the HLC Palanpur  and ready to go. I saw this thread for the first time last night, and I'm ecstatic---- great thread! Many thanks for your enthusiasm, Jan-Olav. It's some tale, isn't it! I'm so glad you enjoy it. This report last left the City of Adelaide clipper at Schiedam, having gone through the cleansing, fumigation and shrink-wrapping process and made ready for the great zig-zag journey across the oceans to her final destination of Adelaide, her name town, in South Australia. But to recap for a moment, here are three YouTubes which I have selected from the collection to which Thijs guided me recently. Thank you, Thijs. They show footage of the departure from Scotland and arrival in the Thames estuary. For those who have to have music in the background of their videos, there is none. So they must skip on, for the only sounds are those of the strong winds buffeting the photographer, the occasional voice, and the triumphant whistles and answering klaxon to mark the successful passing of the little convoy through the narrow Millennium Bridge as the boats leave Irvine. Oh yes, and a dog adding its congratulations! They will miss the atmosphere engendered by the slow, steady progress of the Dutch tugs fore and aft guiding the barge Lastdrager 28 as it bears the clipper out from the dock at Irvine, Scotland, down the river and carefully, so carefully out to sea. I have watched these videos several times, and on each occasion am strangely moved. I see this old ship, almost miraculously rescued from destruction, moving in stately fashion with its attendants along the river whose surface is well ruffled by the wind, I see the leading tug beginning to bounce and the white crests of the waves breaking at the river mouth and hold my breath to think of what conditions may be like as the journey progresses down the coast to London. Then still to come is the zig-zag crossing to the other side of the planet. I have to remind myself that it is over, accomplished without accident, the two Adelaide's are re-united. So, here is the first video showing the squeeze through the bridge. This was the second try, as the attempt the day before had to be halted because the strong winds made passage too risky. Then, the arrival at Chatham, Kent, on the way up the Thames to London where the City of Adelaide was to be moored alongside her sister, the Cutty Sark, for a few days. I have referred to the clipper by her original name throughout, but - as I mentioned at the beginning - when her life as an immigrant ship ended and she was eventually taken over by the RNVR she was renamed the Carrick. On her arrival in London she was given back her true name by the Duke of Edinburgh, and my post at #3 gives links to some excellent Flickr photos of all this. Last edited by wherrygirl; March 8th, 2014, 21:02. I can't still fathom and understand shrink-wrapping something that big.... a shrink wrapped vessel! Strange.... must be something really special to see. I agree, Jan-Olav. Photos show the clipper being encased in sheets of plastic and men welding the seams together, but it is not clear as to how the actual shrinking of the plastic to such a tight fit was done. However, look what I've found: http://dr-shrink.com/training/ tells you all you want to know about the actual process of shrink-wrapping vehicles and boats - though not one quite the size of the clipper! Now we know! 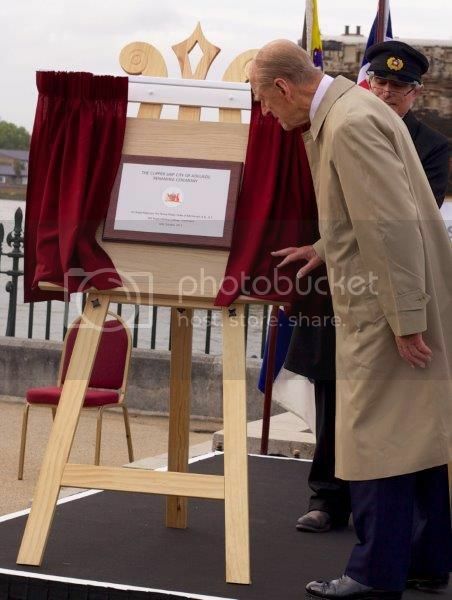 There are some photos on the ship's website showing the ceremonial renaming by the Duke of Edinburgh at Greenwich, which I referred to in #11 and I have picked out three to show here. There is a lovely old legend detailing how this ritual should be conducted. It is said that every vessel ever made is recorded in the Ledger of the Deep and is known personally to Neptune, the god of the sea. In order to change a ship's name the original one must be purged from the Ledger and from Neptune's memory and all traces of its old identity removed, otherwise bad luck will always dog the vessel. 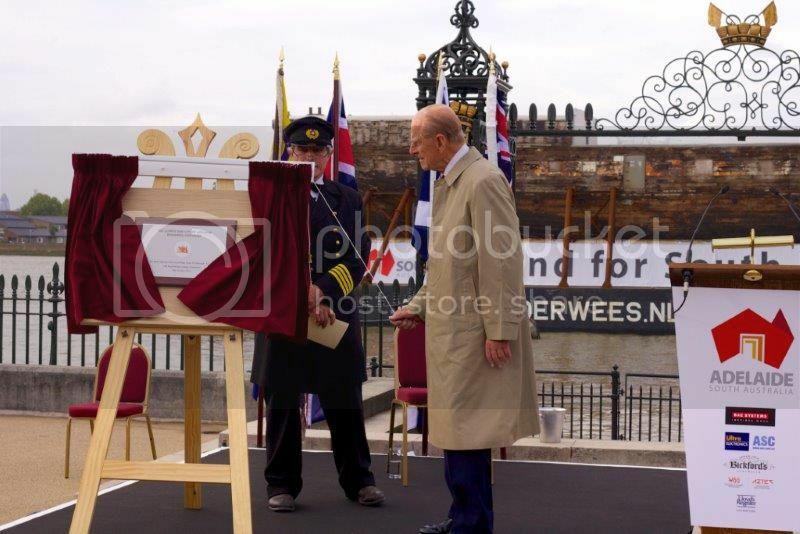 Well, the ship had undergone strict cleansing operations up in Scotland and now the officer in charge of the ceremony held the card bearing the name Carrick over a container and set light to it, letting the ashes fall into the pot. These ashes were then cast into the Thames. Thus the vessel retained no trace of its identity as the RNVR ship HMS Carrick and was considered to be pure and ready to be reborn. Neptune was then addressed, asking that he expunge from his memory all knowledge of the Carrick for she no longer existed. 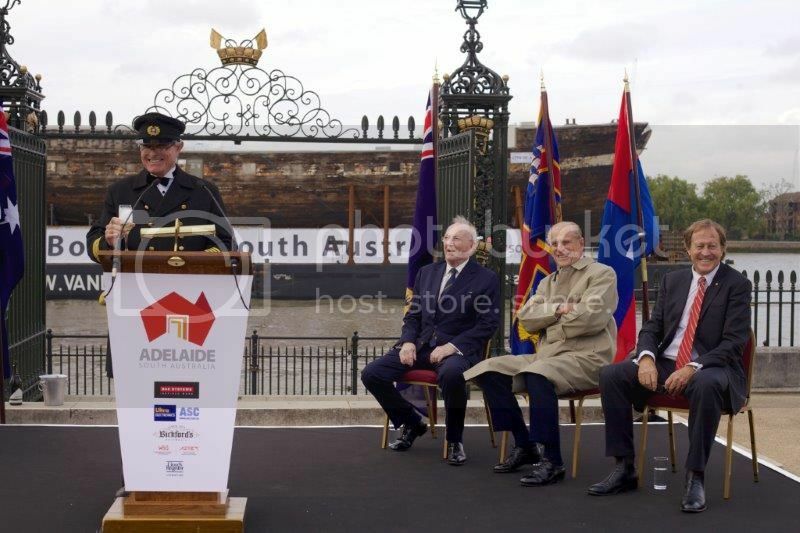 Finally the Duke of Edinburgh stepped forward and declared the ancient clipper renamed as the City of Adelaide. There is a second part of this ritual which I shall show in the next post. Last edited by wherrygirl; March 10th, 2014, 00:31.